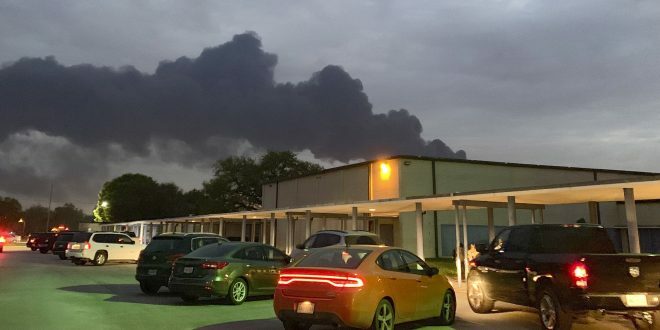 A fire at a petrochemical plant outside of Houston briefly reignited Friday, sending up another plume of black smoke at a site where a blaze had erupted earlier this week. The fire was preceded by a chemical spill into the Houston Ship Channel. As of Friday afternoon, the fire at a tank farm operated by the Intercontinental Terminals Co. in the city of Deer Park, just east of Houston, appeared to be contained, according to local reports. The incident delayed cleanup efforts for the original blaze which was initially extinguished on Wednesday after local authorities had issued shelter-in-place alerts to area residents. In the aftermath of that fire, the Environmental Protection Agency detected elevated levels of benzene. The cause of Friday’s fire is still unknown. There are no reported injuries. Friday’s reignited blaze occurred after a breach in a containment wall around the tank farm spilling chemicals and prompting the Coast Guard to temporarily shut down traffic in a part of the Houston Ship Channel, the site of the nation’s busiest petrochemical port.